The original Supermiata Xida coilover system was designed from scratch to win championships in road course sprint and endurance racing. With the introduction of the longer variants described below, the Xida will now be known as the Xida Race. They are shorter than OEM length in order to provide the necessary travel range when used on a lowered Miata in a competitive setting. Because of the high-end technology, materials and exceptional valving sensitivity, they happen to ride extremely well on the street. Customers have been using them with rave review on their street cars for years. With Xida’s competition oriented length, optimal ride heights are in the 4” to 5.25” range. If you call or email us, the standard recommendation will nearly always be to use the “regular” Xida Race. Xida Race users want the maximum amount of grip/performance/handling and are willing/able or prefer the lower ride heights. Xida Race’s adjustment range tops out around 5” on heavy cars (MSM, any car with full options + rollbar and both tops, etc). The new Supermiata XidaXL are the exact same technology/valving/materials as the original Xida. They are simply longer, within a few millimeters of OEM length in order to function properly at ride heights above 5”, up to OEM height. -You do not wish to lower your car significantly, whether for personal aesthetic preferences, logistical reasons like speedbump or driveway clearance, or simply ease of entry into and out of the car. -You wish to install them on an Exocet or Catfish kitcar that uses Miata underpinnings. -You are using drop spindles on your Miata, which require near OEM length shock bodies. The “Gran Sport” Xida uses the softest “Touring” spring rate option of our regular Xida and comes in a single variant with no customizable options. When used with a long main spring, the softer Touring rate and extra body length combined with the higher ride height allows us to omit the expensive dual spring system and still retain sufficient droop travel and deliver maximum ride quality and handling. 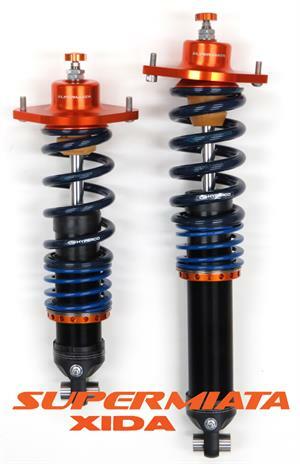 -swaps the customizable rate, motorsport grade Hyperco springs for a lower cost, standard grade 550/350lb spring set. - deletes the higher cost dual spring system, instead using a longer length single main spring and zero rate tender. - deletes the higher cost Billet Coaxial Mounts and uses an NB style bushing mount. -You want maximum day to day ride quality, with great weekend or casual sport handling and don’t need all the motorsports grade options of the normal Xida system. By adding a remote canister to maintain the nitrogen volume, we have enough room inside the Xida XL shock body to implement the electronic semi-active Ace valve in an NA/NB application. -Ride height from 5” up to OEM. -Standalone accelerometer and two button wired fob. Xida ACE are electronic self-adjusting dampers using Tractive’s DDA piston. This system controls both rebound and compression. Same shock as the base Xida but with a magic wiring harness sprouting from the top. The ACE system is like today’s high-end OEM systems, in that it is continuously adjusting the valve in 100hz (10ms) over the full range in force increments as small as 2lbs. That's very fine tuning of damping force based on the accelerometer and user inputs from the small dash mounted control unit.